My Own Slice Of The Web. Backpack stocked, legs stretch, prep complete; off to Binna Burra for a huge full day walk in the Lamington National Park. Myself and a couple of friends set off around 8am from the Binna Burra Cafe for a 21km full day walk of the Ship’s Stern Circuit. Ship’s Stern Circuit is a Class 4 track on the Walking Track Classification with Class 1 being the easiest and Class 4 being the hardest. (Make sure your body is in good condition as the legs, knees, and feet will get a work out if you’re not used to such walks). We kept a bristling pace throughout the morning and soon we arrived at the bottom of Ballunjui Falls. The water is fed by natural springs higher above us and runs continuously even though we have had little rain recently. Next we stopped for lunch on a pinnacle called Charraboomba Rock. The vantage point is spectacular and the views down the valleys are worth the hard step climb to reach the pinnacle. After lunch we make our way along the Ship’s Stern plateau to it’s northerly point; Kooloobano Point. From here you are surrounded by valleys on either side which stretch down all the way to the Gold Coast. From here you it feels like you can almost touch the clouds; incredible. We now headed along the eastern edge of Ship’s Stern stopping at several Lookouts; Milleribah Lookout, Nyoongai Lookout, and Gorooburra Lookout. From these Lookouts on the edge of a caldera, you can see all the way to the areas largest extinct volcano; Mt. Warning. The views are truly spectacular. On the return back to Binna Burra, the last 4km can be a struggle if you’re not used to walking. Because of our bristling pace we knocked over the documented 8 hour walk in 6 hours. The welcome Binna Burra Cafe provided much solace in its fine coffee. Do yourself a HUGE favour and get up in the Lamington National Park if you live on the Gold Coast or surrounds or visit the area. There are plenty of half-day walks which novices can complete with ease. 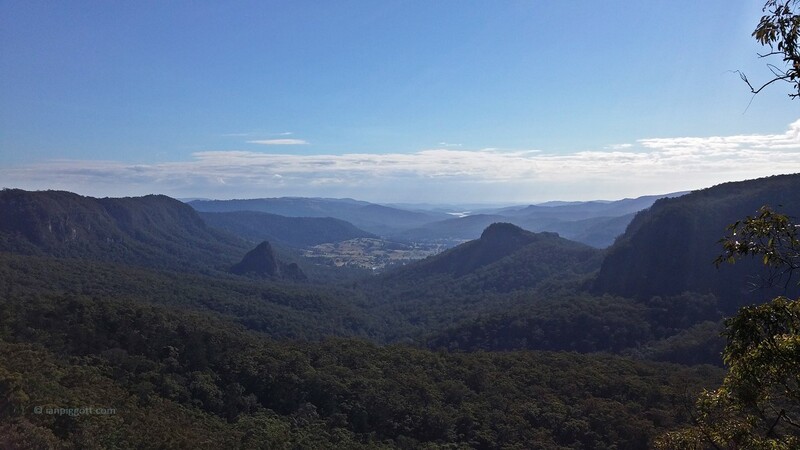 (Walks range from 1.2km – Rainforest Circuit; 2km – Bellbird Lookout; 5km – Tullawallal Circuit and Caves Circuit; 6km – Gwongoorool Track; 12km- Daves Creek Circuit; and many more).